Places, Events, People and local History, illustrated with text, photographs, etc. by the site owner. Photographs or items supplied by others will be given credit. Text and/or images by the author or other contributors are COPYRIGHT, and may not be reproduced without permission in printed publications of any kind. However, we have now introduced a facility under each aticle, whereby you may now legally post or forward these images to social media, or email to friends,without permission. 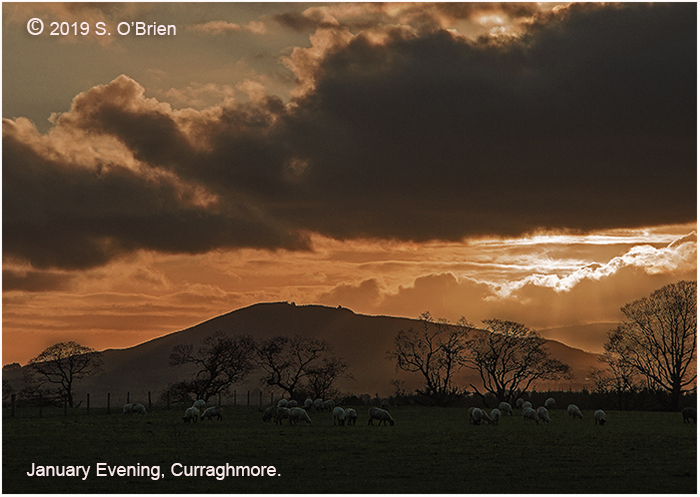 Sunset on a very cold January evening at Curraghmore. Croughán Hill in the background. 096 The arrival of SIDELINE film unit. A TAPESTRY OF LIFE IN PORTLAW! 109 Mass at Clonagam Cemetery. Taken on August 30th, 2010. Having been taking photographs of the Portlaw area, and it's people, since I arrived here to retire in August 1999, I have now decided to create this Blog (web log) to show some of those pictures, most of which have never been seen by the public previously. Some of these images have, however, been seen outside the area in camera club photography in recent years, and a small few have been quite successful in competitive events, regionally and at national level. There is a facility under each image, whereby you may comment on the contents, if you so desire. Please mention the site to your distant friends and relations, especially those far from home. All images on the site are at a low resolution (72 dpi) to ensure fast downloading. The originals are all at a resolution of 300dp i.e. highest quality. The content of the site, both text, photographs and illustrations are the copyright property of the site owner, unless otherwise stated. Articles by other contributors may not necessarily reflect the opinion of the site owner. A Happy New Year to you all! CorporateSoulWoman "Molly Harvey" "Public Speaking"
Portlaw 'Fallopia Japonica' 'Japanese Knotweed'.